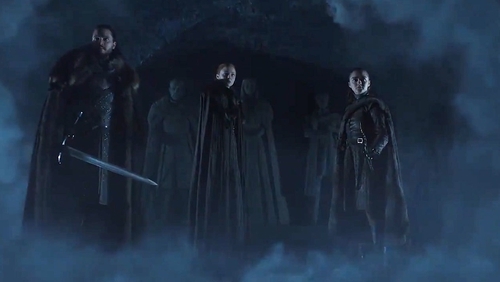 HBO has announced a new feature-length documentary called Game of Thrones: The Last Watch, which will air after the end of the hit fantasy series. The eighth and final season of Game of Thrones runs from April 15 - May 19, and one week after the highly-anticipated finale, the two-hour long documentary will be shown. Directed by filmmaker Jeanie Finlay, The Last Watch will chronicle the making of the final Game of Thrones season and will draw on Finlay's experience of being embedded on the set for a year. It follows the cast and crew as they contend with issues such as extreme weather, tight deadlines and fans desperate for spoilers. In a statement, HBO said the documentary "delves deep into the mud and blood to reveal the tears and triumphs involved in the challenge of bringing the fantasy world of Westeros to life in the very real studios, fields and car-parks of Northern Ireland". The final series of Game Of Thrones starts on April 15 and will be made up of six feature-length episodes.